LOCATION.--Lat 41`08'17", long 77`26'32", Clinton County, Hydrologic Unit 02050203, on right bank 1250 ft downstream from Jay Street bridge, and 2.1 mi upstream from Bald Eagle Creek. PERIOD OF RECORD.--1975 to current year. GAGE.--Water-stage recorder and concrete control. Datum of gage is 534.519 ft above North American Vertical Datum of 1988. Satellite and landline telemetry at station. REMARKS.--Daily discharge not available from 1975 through September 2017. 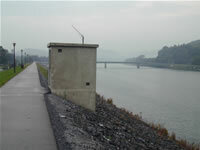 Supplied by USGS: Maximum recordable gage height (stage sensor operational limit) - 40.9 ft; Data transmitter operational limit - 42.3 ft; 39 feet at top of levee. Supplied by NWS: Action stage-17 ft, monitor for rising waters; homes downstream along Antes Creek affected; Flood stage-21 ft, the right or south bank overflows in areas not protected by levee system; Moderate flood stage-23 ft, considerable flooding if levee not in place; Major flood stage-25 ft, numerous homes and businesses would be flooded if levee not in place.